Everyone loves a picnic, but cold sandwiches and leftover chicken can only be so much fun. Show up to a tailgate party with egg salad, and everyone laughs you out of the stadium. Portable gas grills are perfect for your outdoor parties! Get ready to rock the brats, make heavenly hamburgers, and grill the goodies! 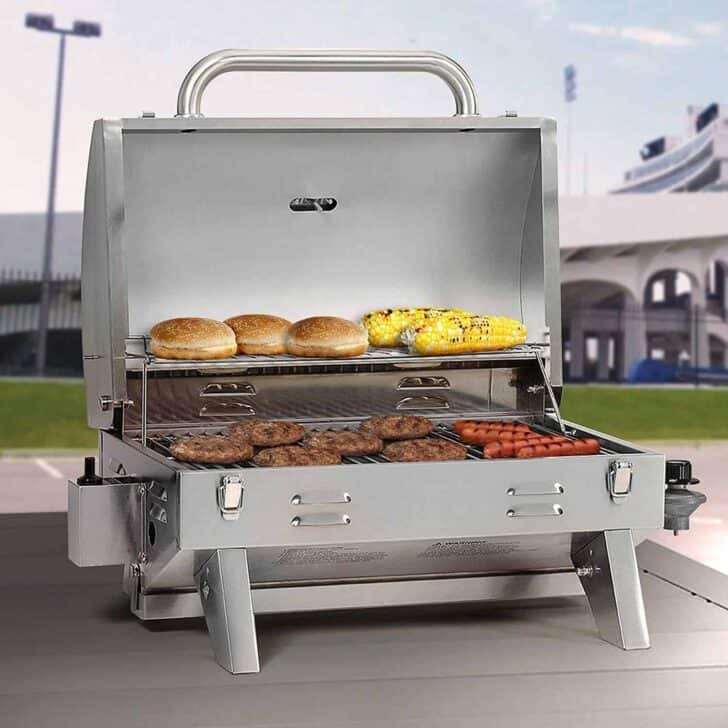 Don't let those shiny surfaces and slick salespersons steer you away from our Top 6 Portable Gas Grills of 2018! 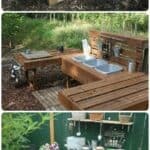 But if you’ve ever walked down the barbecue aisle at a home center, or worse, go to an outdoor kitchen-specific store, the choices become overwhelming. Plus, who can resist the dream kitchen with a grill big enough to cook a side of beef with the shining chrome and stainless steel gleaming under the halogens? Some of those prices are worthy of smelling salts. However, most portable grills are under 300 bucks, and we’ve found several less than $150.00 that have good reviews! How do you choose one of the portable gas grills? Let us help guide you! 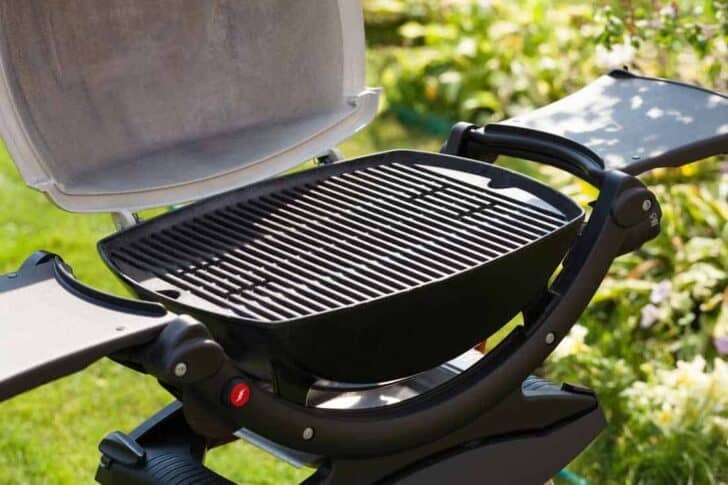 Do the Top Portable Gas Grills have those gleaming grates? I want the lightest of the portable gas grills, right? 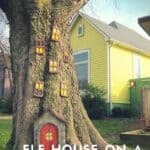 What fuel source is best for the way I want to cook? What’s your budget? Don’t go into massive debt because of the sales pitch! How often will you use the barbecue throughout the year? What features do you need on your grill? How many people will you typically serve each time you grill? Do you need a unit that stays in one place (like an outdoor kitchen), or do you want one that you can transport for camping, tailgating, and parties? How long do you expect your grill to last – like will a disposable, charcoal-fired one meet your needs, or are you a camping-master? Did you know that grills come in four fuel types? The fuel types include Propane/Natural Gas, Electric, Charcoal, and Pellets. If you’d like to learn more about the types available, we describe the fuels at the end of this article. (British Thermal Units): indicate the output of gas that’ll heat your grill. The BTU rating is the maximum amount of heat available for the barbecue. Note – grills with 2 or more burners list BTUs per burner. High BTUs can mean a faster heat-up time, higher temps during cooking, and quicker recovery of temperature when you open the lid or add more food. WHAT TO WATCH FOR: not all models are the same. If the unit is made of thin materials that let the heat dissipate quickly, you won’t get as much BTU for the buck – meaning you’d need more BTUs on an inefficient unit compared to lower BTUs on a higher-quality grill to cook a steak in the same amount of time. Sometimes very high BTUs can mean that the manufacturer is compensating for lighter materials. Read the reviews carefully! This is simple. Smaller surfaces will only accommodate a few burger patties. Larger areas will allow you to cook more burgers or the flexibility to cook your entire meal on the grate. If it’s just for one or two, why pay for all that extra space that you’ll have to use resources to heat up? But, if you like to tailgate, consider what you want to cook, and how many people you cook for. Perspective: a 200-sq-in. cooking surface can hold up to 12 burger patties with space in between. If you’re cooking a meal, such as a steak, a baked, potato, and corn on the cob, plan on about 100 sq. in. per person is a great way to estimate the size of the grill you’ll need. This is a feature that always catches eyes. That vast expanse of shiny metal makes visions of ribs and steaks dance before your eyes. If you want a lightweight and easy to clean grill, choose stainless steel grates. If you desire those mouth-watering grill-marks and an all-around durable, heat-retaining grill, then go with cast iron – including porcelain-coated varieties. Eventually, all grates will rust, so clean them thoroughly, let dry, and lightly spritz with cooking spray on both sides to protect. Stainless steel has excellent longevity. Aluminum will eventually burn up, and cast iron burners eventually rust. Stainless resists corrosion the best. One interesting feature to notice is the warranty on the burner. If you’re looking for longevity, watch those warranties offered by the manufacturers. Some are as short as 90 days; others are 3 or more years on the burners. Most grills, including portable ones (gas models), come with some onboard method to light the fire. Some run on a battery, while others use a push-button or a dial to generate a spark. No matter the manner, when you’re traveling with your grill, plan on a backup, such as a simple candle lighter or those long wooden fireplace matches. If weight is your primary consideration, see the grill in person first. Push on a couple of corners and see if it flexes. Look for stability too – is it stable on the legs it sits on? How is it constructed? Is it welded or just nuts, bolts, and cotter pins? Safety is important.You want a stable, durable unit that doesn’t have a lot of cheap hardware that’ll fail quickly and sharp edges to cut you when you’re packing it up. Eventually thinner materials discolor with use. The thinner the metal, the quicker it’ll discolor. A thin metal may cause the paint/coating to peel. With cast iron, it’ll rust if not properly maintained. If the porcelain coating or paint chips off, you’ll need to either repaint it or lightly oil the bare metal surfaces to prevent rust. If it has a rolling cart, an accessories cart, side tables, or similar, be sure you feel they’re stable, sturdy, and well-built enough to last a few years. Don’t forget to check hinges, handles, and other hardware! 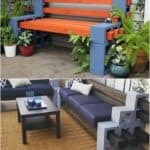 Do the hinged parts, doors, legs, and grates latch down for safe traveling? Does it have to sit flat or does it have to be stored up on one end (meaning you may have to do a thorough cleaning before you move, so no grease drips in your vehicle)? Do you NEED a model on wheels? Does the model you like need two people to set it up or move it? Will the folded-down size fit into your trunk or storage space on your RV? For propane or natural gas, you can use a 1-lb pre-filled canister for lightweight transportation. Or, you can use those traditional 20-lb bottles that you see with home grills and strapped to the front or back of RVs and campers. Keep in mind that although the grill may state that it is propane, it is probably set up for the small bottles. Plan on purchasing an adapter valve to accommodate the 20-lb containers. Some conversion kits cost $100 or more, so be sure you’re aware of that BEFORE buying. For the other types, you have to plan and be sure you have enough charcoal, wood, or wood pellets – or have them available nearby where you’re camping to cook your meal. Is the grill ready to go right out of the box, or do you have to do a partial to complete assembly? Some only need the handles installed, while others were listed as “difficult” to assemble. If you’re not handy, keep this factor in mind, or enlist the help of a good friend who can help you. This consideration may or may not matter to you. Some want to purchase from their own country, while others are just bargain hunting. This is a personal choice. Our recommendation is to consider warranties and materials used when looking at this factor. 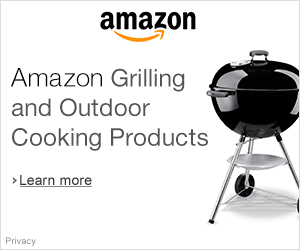 Three Weber Q Series grill models were popular across many websites, and receive high overall customer ratings on sites like Amazon. The main difference between the three popular models is size and BTU. Therefore, we're counting these three variations as one of our top 6. Propane comes in refillable portable cylinders, as well as small, pre-filled tanks (such as the familiar Coleman tanks), It’s suggested to have a second cylinder/bottle since you can’t readily check a gas gauge like in your car. Nothing kills a party quicker than raw food or trying to find a place to fill your propane tanks on a holiday weekend. The benefits of Portable Gas Grills include easier cleanup (no ash from coals), convenient temperature regulation with control knobs, and the ease of startup. Many have push-button automatic starters, or you can go “old-school” and use matches or lighters. 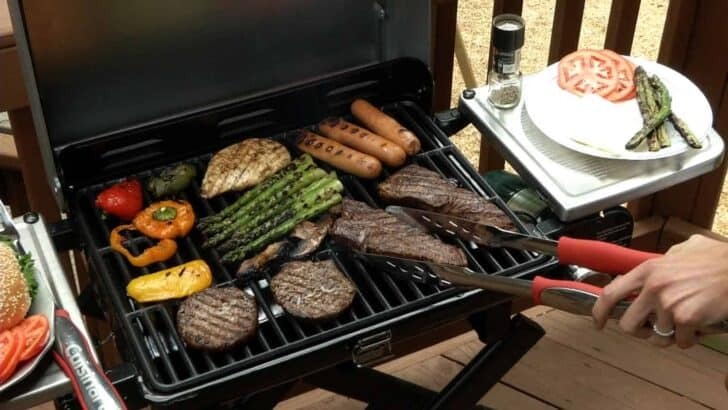 Using portable gas grills is safer than ever according to the Hearth, Patio & Barbecue Association because only cylinders that have a mandatory overfill prevention device (OPD) can be refilled or exchanged for refilled bottles. This means that cylinders are only filled to about 80%. You’re not being shorted or cheated out of a full bottle. This allows expansion room when temperatures rise, so the gas isn’t unintentionally being released into the air, thus reducing accidental fire risks. Can I use electric grills instead of Portable Gas Grills? SURE! You don't have to use Portable Gas Grills. 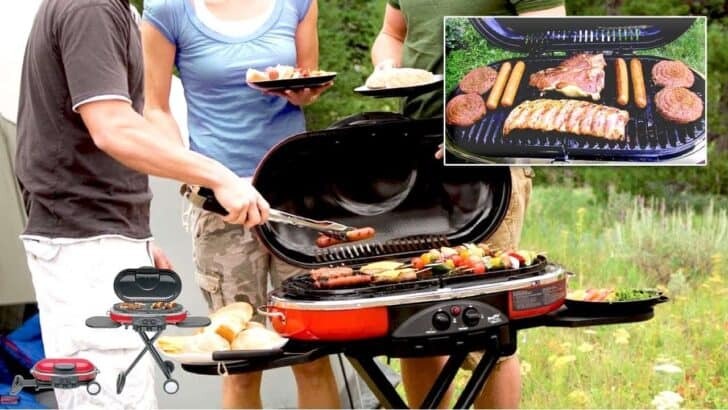 Electric grills can be portable and small enough for your countertop, apartment, or condo, and require no charcoal or gas fuel sources. You need to take the same precautions you would with any electrical appliance. Inspect the cord before use, and unplug when not in use. Don’t use it in the rain, while bathing or swimming, or scuba diving (haha). Smaller units are perfect for singles or two people, and would naturally be portable. Bring a safe, outdoor extension cord if you’re using one of these little beauties in your RV or at a campground with power. Always route power cords so that no one trips on them and sends those pork chops flying! Pellets are a hybrid between wood fires and charcoal. They’re gaining in popularity because you can now get them in a variety of flavors, including hickory, mesquite, and oak, thus cooking and adding flavor at the same time. Pellets are energy-efficient and clean-burning and come in a variety of flavors, and don't require pre-soaking like wood chips. They’re all natural and made from 100% of the wood indicated on the packages. Some pellet grills have a dual-fuel unit that’ll allow you to switch over to gas, which can reach higher temperatures than pellets can. 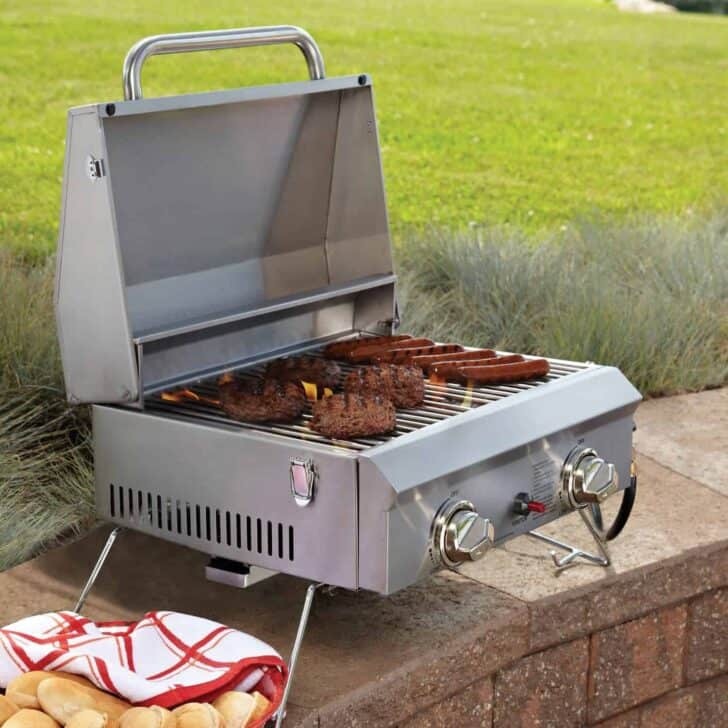 Hope you know now how to choose the perfect portable gas grill! Updated on 2019-04-22 - Images from Amazon API. 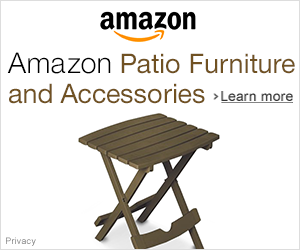 Logos are trademarks of Amazon.com, Inc. or its affiliates.